Because I had a few other things to do last Thursday I didn’t get a chance to share my CSA box with you all. It had the usual eggs, pasta, some greens and veggies, etc. 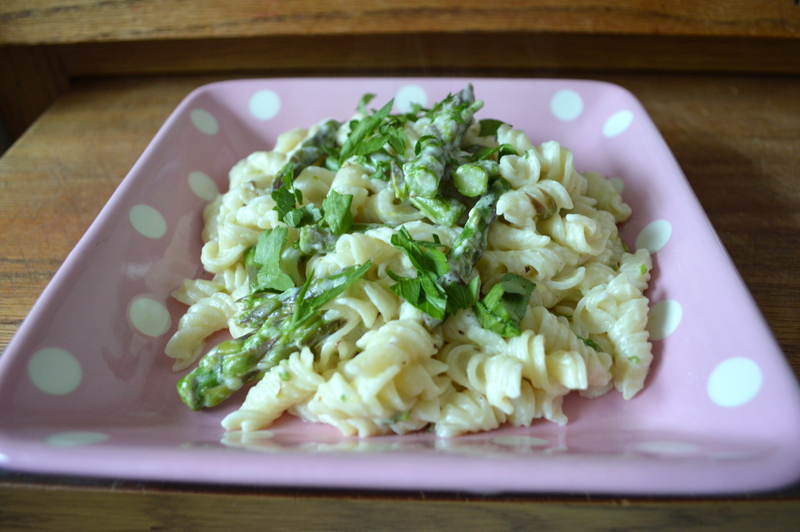 One of the recipes was for Fusilli with Asparagus and Truffled Fromage Blanc. I made this a few days ago so I could clear out the refrigerator for the new box this week. This recipe used up a good portion of ingredients. The only thing I had to go out and buy was a lemon and it has fed me for two days now. It is also one of those 30 minute recipes. Quick and easy. While your water is coming to a boil for the pasta you can be preparing the asparagus. While the pasta and asparagus cook you can get the cheese ready. Mix it all together and it’s on the table in under 30 minutes. I guess it all depends on how long it takes to get your water to a boil. I cut the lemon zest down to 1 teaspoon instead of the 1 tablespoon the recipe called for, it sounded like way too much lemon. I didn’t drizzle lemon over the pasta when it was plated, instead I added fresh parsley and Parmesan cheese. First thing is the Fromage Blanc, all I knew about it was it’s French for white cheese. I knew it was a fresh cheese but not anything else about it so I had to look it up. I ended up at the New England Cheesemaking Supply Company’s website. The consistency of the cheese is soft, yet you can crumble it with your fingers. It’s definitely wasn’t the consistency of yogurt, which I guess it can be sometimes depending on how it’s made. It’s a tangy, spreadable cheese. Add some fresh herbs and spread it on toasted bagels for breakfast. You can use it as a substitute for ricotta or even quark. Quark? Quark is a fresh German cheese, they use it in many of their baking recipes. I have a couple of German cookbooks that use quark as an ingredient and didn’t have a clue where I could get some. Now I guess I can try fromage blanc and see if that works. 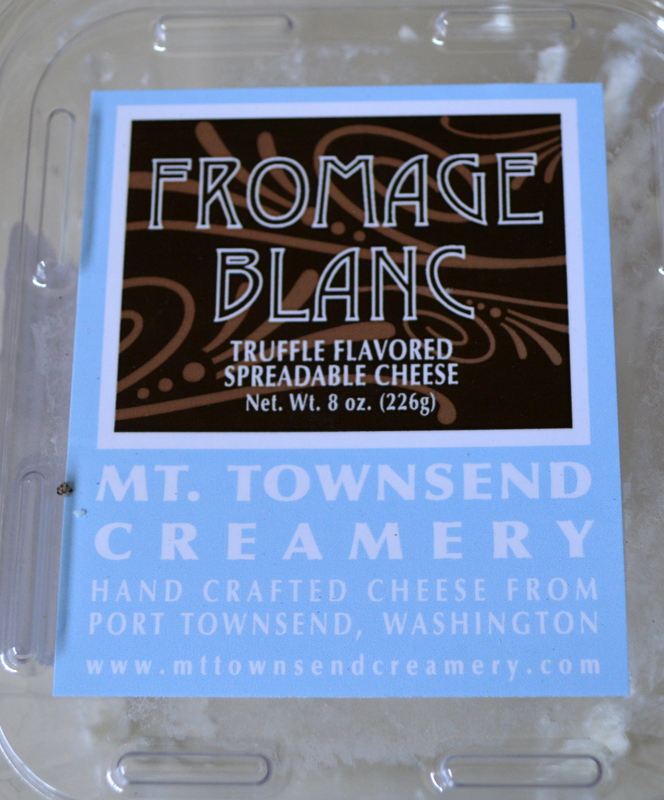 What is truffled fromage blanc? The cheese I got had black truffle flavoring if you can believe it. 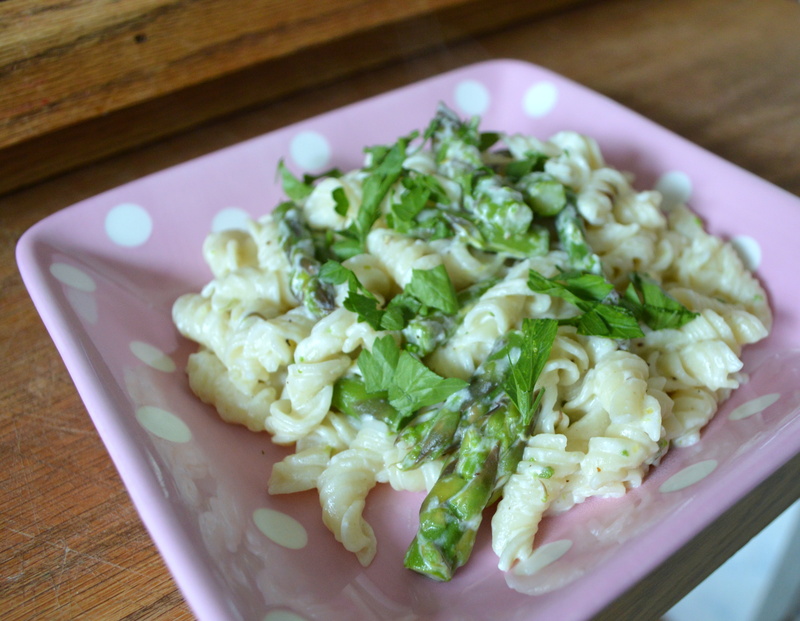 It was pretty danged good mixed in with the pasta and asparagus and made a nice creamy coating for the pasta. I also had some fresh parsley from the box and sprinkled a bit of that on top of the pasta with some Parmesan cheese. Bring a large pot of salted water to a boil. Add the pasta and cook for 2 minutes. Add the asparagus and continue cooking until pasta is al dente. Before draining pasta save about 1/2 to 1 cup of the pasta water. Drain pasta and asparagus. Meanwhile, combine olive oil, lemon zest and cheese in a large serving bowl, breaking up the cheese as you put it in. Stir until combined and smooth. Add hot pasta and asparagus to bowl, along with a tablespoon or two of the reserved pasta water. Toss until smoothly combined, adding splashes of pasta water as needed to create a creamy sauce. Season with salt and pepper. Drizzle with lemon juice if desired. Sprinkle chopped parsley and Parmesan cheese over pasta if desired. Makes about 4 servings. This pasta is realllllyyyy yummy! It really was good! I honestly wasn’t sure about when I was reading the recipe but thought what the heck, it is going in my family favorites cookbook to be made again that’s for sure.